An original style safari camp harking back to the days of explorers, Camp Kalahari is on Hyeana Island on the edge of Makgadikgadi Pans National Park. The camp is set amongst palm trees, overlooking the seemingly endless salt pans. This is an ideal base if you're looking for comfort and fun with adventure thrown in! There is a large lounge, library and dining area and 10 'meru' style tented rooms including one family unit with 2 bedrooms. All have en-suite bathrooms with outdoor showers and hot water. There are two seasons in this region, the wet season from November to mid April then dry until the end of October. In the wet season, water and flamingos fill the pans and flowers bloom across the plains, animal action is busy with plenty of lion and cheetah chasing their prey. The highlight of this season is the largest migration in southern Africa where 30,000 animals, mainly zebra, migrate across the pans. In the dry season the waters disappear and the desert animals are easily seen. From the camp you can enjoy game viewing around Makgadikgadi Pans and Central Kalahari regions with a variety of desert adapted species. A highlight of this camp is bush walks with the San Bushmen, full of ancient knowledge that has been passed down generations. 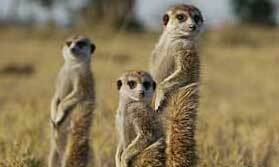 You can also get up close to the deserts most endearing of animals, the meerkats. Take a walk at dawn and find them emerging from their burrows, seemingly oblivious to you. They have been known to climb over people as they go about their foraging, a gorgeous experience! Visit the resident family of meerkats. Enjoy a guided walks led by Zu'hoasi Bushmen. 4x4 vehicle safaris in the Makgadikgadi National Park and night drives. Location: On Hyaena Island on the edge of Makgadikgadi Pans National Park. Rooms: 10 Meru-style tents including 1 family unit comprising 2 tents and an interconnecting bathroom, which accommodates up to 2 adults and 3 children. All tents have en-suite bathrooms. The camp accommodates a maximum of 23 guests. Facilities: There is a thatched library, lounge and dining area. Dining: Meals are served communally in the dining room. Children: Children of all ages are welcome. Those with children aged 12 and under must book a private vehicle. Communication: There is no mobile reception, no direct phone or fax and no internet. A traditional game viewing safari with the thrill of Vic Falls, nature walks and, of course, entrancing encounters with meerkats. "Just astonishing facilities in the middle of nowhere! Great staff, amazing food, superb tents with 'the hottest wettest showers in the Kalahari' - probably true! Hosts Fabio and then Kat happy to take time to chat and listen to any concerns we had (none)." "Our tent and bathroom got very hot during the day, some loungers outside the tent would be nice. The food was not up to standard but I believe this is in hand. The night spent on the salt pans was a highlight of the entire holiday, it was wonderful." "Set miles from anywhere this is a camp styled around the 1940's period with good solid furniture and an ambience to match." "Very friendly place/staff. A real family atmosphere. They could not do enough for you. Bart our guide was amazing. He loved the place and it showed with outstanding knowledge of animals, plants and birds. He took us out at every chance and we loved the night drives and the fact there were so few other vehicles around. Our morning with the habituated meerkats was fun and informative. As it was my husband's 60th coming up, on our last night they set a table up for us by the plunge pool with bubbly and candles. Although you did not have a choice at lunch/dinner, the food was excellent and our 'tent' on stilts was pretty new and set away from the others so you did not feel crowded at all. We were sorry to only have 2 nights there."